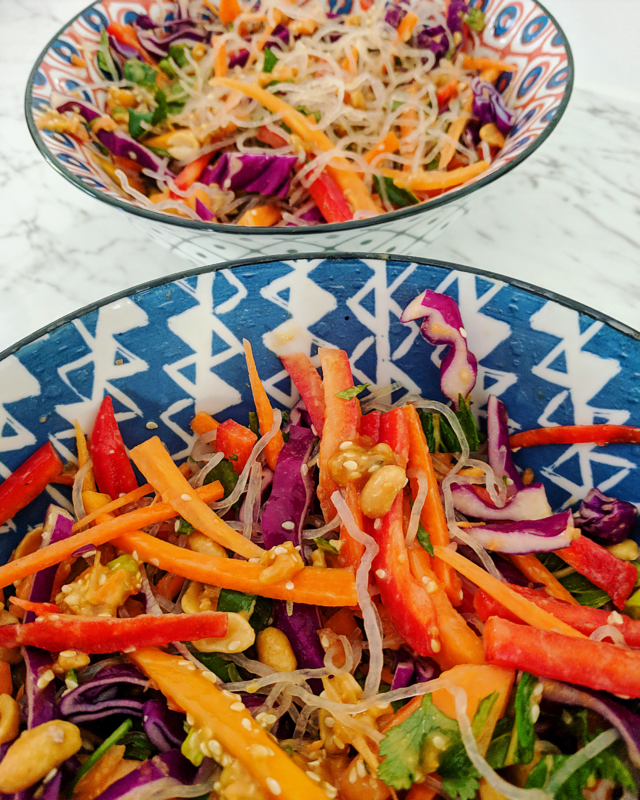 This is one of my FAVOURITE salad recipes, because it combines all of my must-have elements: it's healthy, crunchy, packed full of flavour and vegan. If you don't have kelp noodles you can substitute them for vermicelli, but I'd highly recommending trying to get your hands on some as they provide such a lovely texture to this crowd-pleaser. Make a big batch and enjoy it throughout the week, and definitely serve it at your next dinner party with some grilled tofu, smashed avocado and sweet potato fries. Yum! Combine all ingredients into an extra large bowl and toss well to combine. If you're not planning on eating straight away, cover and store in the fridge until ready to serve before adding dressing. Combine all ingredients and mix well using a spoon, to ensure the peanut butter is blended into the rest of the dressing. Just before serving, add dressing to taste to the salad. Serve with tofu if desired.